Following the opening introductory scenes, you are playing as Darrel, and find yourself and Victoria in the corridor outside your rooms. Take a moment to explore your environment. The LEFT mouse button is used to examine items. The RIGHT mouse button is used for actions - picking up objects, opening doors, climbing stairs, pulling levers, starting conversations, and also for getting a 'second opinion' about objects that you have examined with the left button. Throughout the game, as you enter a new area, look at everything. Be patient, and relax. The guys who made this game spent a lot of time writing and recording comments, some of which are banal, and some of which are informative, and some of which are hilarious. Get your money's worth, and don't rush through it. I am not going to outline every little detail, you are the investigator here. Trust me, by reaching beyond this walkthrough, you will improve the gaming experience by an amount proportional to your curiosity. Watchmaker is very non-linear. You are free to meander around and examine things and talk with people. Very few doors are locked, and the progress through the game can be estimated by observing the Time-Stamp that appears whenever you change locations. (This helpful function can be toggled on or off by pressing the 'D' key; I recommend you leave it turned on.) Each time you complete an essential segment, the clock will advance. I also strongly recommend that you choose to have the Subtitles switched on; there will be occasions when the audible portion of the voice-track does not function, and the subtitles will still be visible. I suspect the programmers missed a few items when the game was translated into English and the voice-overs were recorded. Not a big deal, but you will miss some information with the captions turned off. Be Careful Saving and Loading Just a word of caution: Press F1 to see the Save/Load screen. If you have an existing saved game, and you click on it thinking you will be loading it, NOT! You will over-write your previous game, without warning. Don't get me wrong; I like the interface, but it has its pitfalls. In order to load a previously saved game, you must first click on 'Load' in the Menu-bar. Then select the one you want. If you have progressed, and want to go back to check something, be very cautious. You can cross your saved games and wind up very bewildered, because you 'should have' already done something, and now need to repeat the actions. There is an elevator (lift) behind you - it's the Service Lift (it's busy right now.) There is another lift (the Guest Lift) in the central cobblestone area ahead of you. Take that one down to the Lobby level (Floor 0) and exit the castle via the front entrance. Poke around. Straight ahead is the gate where you first came in. Let's call that way North. To the right (East) is a ramp down into the garage. You will get in there later. Go to the left (West) and stop to chat with Raul Hernandez. He's the Gardner - oops Landscape Artist. ALWAYS take the time to talk with characters, and use each subject until it is exhausted. Sometimes it gets repetitious, but often it triggers branches of conversation (frequently essential) that give you openings into other characters. Pay some attention to Who gets along with Whom, and what they think of each other. Understanding these relationships will help you figure out what to do, and why you are doing it. If you stay on the stone path, it takes you to Henry, the Caretaker's front door. You can visit with him if you like - it's not necessary at this time, but I recommend it, because it will enrich your understanding. If you do visit him, take the Chisel from the shelf above his desk. If you hang a left and head South, you will pass in front of the Chapel which is attached to the Castle, and see Raul's residence at the South end of the path. Go left again (East) and soon you will approach the Greenhouse. As you do, it begins to tremble. Victoria, Raul and Henry run out to see what is going on. The greenhouse explodes! Examine the glass and the hole (use both the right and left mouse buttons - get used to doing that) and make your way back toward the Castle, having a look at the Aviary on the way. Find the Well, and examine it, and the cover. When you try to open the cover, Raul comes and warns you to stay away. He throws his empty water bottle into the bin. Examine the bin. Use the Close-Up (space) view, and the Shift/Up-arrow to lean forward and see the bottle. Take it with the right mouse button. While you are right there, re-enter the Castle via the French Doors at the Pool. Left click and you are 'not dressed.' Right click on the pool, and there is 'Something Glittering' at the bottom. Hmmm. We might need to retrieve that object somehow. Go to the Diving-end and talk with the Supervisor's wife, Jude Anderson. Here's the non-linear part: For fullest gaming, as Darrel, ask her about everything. Then switch to Victoria (F8) and ask her about everything again. You get much insight into the people. The only essential question - as Victoria, ask her about Carla's private live. (Darrel was too shy to ask.) As either character, look at the old wooden door. Meet Greta - my, she's a toughie! For a slightly less polite encounter, have Darrel do it. Then, as Darrel, exit the white door at the other end of the room. Go through the Stained-Glass door into the Dining Room and explore it thoroughly. On the fireplace mantel is a clock. Stand in front of the clock, press <Space> to see close-up, and shift your view upwards (mouse forward or up-arrow) and take the Clock Key. Then go into the other section of the dining area and open the Cupboard. Use the close-up view again; this time press 'Z' to squat down, (press 'A' to stand back up if you need to) and find the Cutlery. Take a knife. You ARE poking around and exploring everything, aren't you? That's half the fun of this game, and I am not going to keep reminding you. Now exit the Dining Room the same way you came in, go into the Pool Room (Natatorium) and straight ahead into the Guest Bathroom. The Service Lift is working now; take it down to the basement level. If you poke around, you find three doors. One is locked, one is the Wine Cellar, and the other is the Laundry. Go into the Cellar, and take a bottle of wine. Go back upstairs, and into the kitchen. As you look around the room, find the pegboard with the Hook hanging on it. Use the close-up view to discover the Keys. If you try to take them, the Cook says "Hands Off." Talk with the Cook. Ask him about himself, and about his past life as a sailor. Now the tricky part - press Tab to open your inventory. Click on Victoria's image to bring her into the kitchen with you. Use that bottle of wine with the Cook, and a cutscene ensues. While the Cook is reminiscing, Victoria will take the Keys. Here's the catch. Darrel has the empty bottle and the knife, items which you will be using in the lower level; and Victoria has the keys to the locked room down there. You have two choices: you can move both characters to the basement (one at a time by switching back and forth between them,) so Vic can unlock the door, and Dar can accomplish the tasks - or you can have Vic give Dar the keys. Here's how to do that: As Darrel, open your inventory (Tab) and left-click on any item. Then, at the top, left-click on Victoria's name, opening her inventory. Left click on the keys, transferring them to Darrel's inventory. Then re-select Darrel's inventory and click on "Close." Now you are still playing as Darrel, and have all the required items. Note that if you Close while Victoria's inventory is displayed, you are playing as her. Either character can accomplish the following: Go to the Laundry Room and use the empty bottle on the Dispenser. Go to the Boiler Room and unlock it with the Cook's Keys. Turn off the swimming pool equipment with the Switch in the far corner. Use the Knife on either Filter to open it, and pour some Detergent into the filter. Close the filter and turn the pump on. The pool gets sudsy, and Jude calls Raul to help with the problem. Now the pool is empty, and you can right click on the Shiny Object to retrieve it. I suggest you use Victoria to pick up that bracelet, for she needs to give it to Carla and talk to her. Go to the fourth floor and find Carla, the maid. She is reluctant to talk. Have Victoria give Carla the bracelet. Now she trusts you, and will answer come questions. Ask her about anything you want, but the following is essential: herself, and about her private life. Then, under Things and Facts, ask her about the Gala. (If the Gala option does not seem to appear, look at the far right end of the question box. There should be a downward-pointing triangle in dark red. It's hard to see. Scroll down to reveal more questions. After she finishes telling you about Corona, she gives you a Casino Banknote. Examine it, and turn it over to reveal a clue. The chips are resting on 4, 17 and 30. Those numbers just might come in handy. (Either character can do the following.) Open the cover on the well and go down into the Cistern. At the end of the passage, right-click on the Rubble to climb up into the next room. Look at the Machine. Use the close-up view to see the Indicators. This is an important clue. Note the position of each dial. Now, pull the Lever. The Indicators are all the same. This is an equally important clue; just easier to remember. You can think of them as clock positions; 2, 7, 4, 11, 9. Write it down, because it will be quite a while before you use this information. What's more, you will be in a hurry. Using the Close-Up view, press the big Button. Boom! there is an explosion and a new hole in the wall. Go there, and explore Raul's basement. Take the Cutters, the small object on the right-hand end of the sideboard. Don't worry about that Trap-Door, you can't get there. Open the lower left end of the Sideboard, and look at the Briefcase. Take it out, and learn that it belongs to Corona. Can you figure out the combination lock? Use that close-up view and press 'Z' to slide down your view. 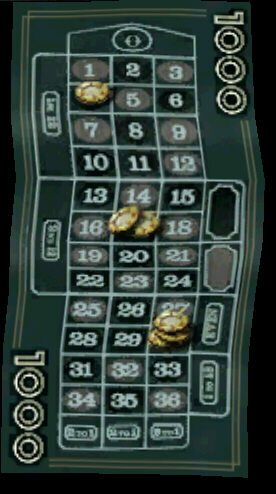 Try the Roulette numbers from the banknote pictured above. With the correct numbers dialed in, right-click to open it. Go close-up again to examine the contents. We'll leave the money there, but take the Cassette. Have you noticed something? Sometimes, it is impossible to switch characters, or trade items. Raul's basement is one of those times. Exit the well. If you have not found the Supervisor's office and talked with him, this is a good time to do that. You can use either character, but I recommend Victoria. The quickest way to find the office is to get into the Kitchen, and use the other exit, the one closest to the Cook. At the top of the stairs, you find a Lounge area, a Conference Room, the Office, and a locked Laboratory. Another way to get there is to use the Guest lift to Floor 3, go through the Bar, the area with the Blue Carpet, and down the stairs. If you go via the Guest bathrooms, you will likely run into the Caretaker. Talk with him it you haven't already. If you go via the Lounge, you will likely run into Greta, the Housekeeper. Talk with her if you have not already. Either way, go into the Supervisor's office and have a conversation with him. When you seem to have exhausted everything, and would like some privacy, go to the Aviary (use the other character if you like, whoever it is will need the Cutters) and clip the padlock, releasing the Dove. Anderson is distracted by the loss of his pet, and you will be able to look around his office. While you are still in the Office, take the Photo of Jude Anderson. Notice her really Unusual Necklace. Sounds like a clue. 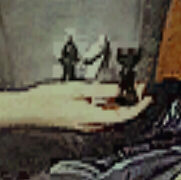 Examine the picture to see the necklace, and turn it over to reveal a date; probably a wedding anniversary. It says Sept 7, '95. Also, look in the File Cabinet. You discover an invoice from the company that installed the Wall Safe in his apartment. Note the combination: 1 2 4 8 0. Exit the office, and go to the Keypad to gain entrance to the Lab. Use the clue from the photo to get in. Just to your right is a Metal Box. Use the close-up to see the Red Button. Press it to open the box. Take the bag of Blood. Examine the Container. Turn around and find the Drawer. Close up, you can see the Syringe. Take it. Go to the other side of the room and see the shelf with the skull? Look on the shelf below to find the Acid. Use the Syringe on the acid. Exit the lab. (Once you have solved the keypad, right-click on it to get in or out.) Talk to Anderson about what you have found, and when he denies everything, show him the photo. He breaks, and gives you the Keys to the old wing. Now that you have the correct keys, go to the Pool Room and open the door to the Old Wing. Immediately turn right and go into the Salon. Find the Dresser, and notice the Painting which has slipped off its nail and is on the floor behind the dresser. Pick up the painting and examine it to reveal an important clue. 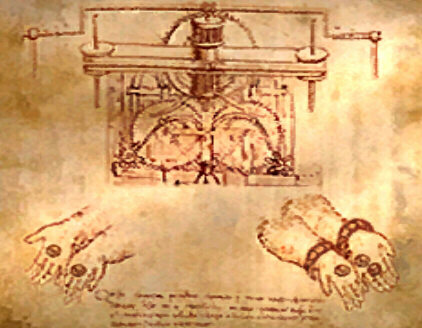 Two sets of hands; one holding two coins, the other holding three coins. Leave the Salon, and go down the corridor, around the corner and climb the stairs. Go into the first room you come to, and examine the Showcase on the wall. It's a portrait of Anna, wearing that same unusual necklace, and holding three Chess Pieces in her hands. 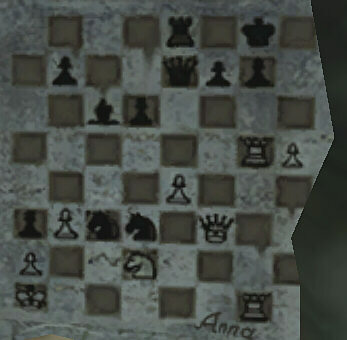 Make note of those chess pieces - a Black Bishop, a White Knight, and a Black Rook. Just below the portrait is a Cylinder. Take it, and put it on the Phonograph. Right click on the Phonograph to hear the recording. What is Darrel doing? Is he still standing around outside? If so, switch to him (or her, if you are using the opposite characters) and go to the Mausoleum. Look at the spot where the exterior wall was damaged when the Greenhouse exploded. 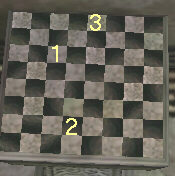 Right-click on the chessboard to see it close up. You need to take note where the Black Bishop, the White Knight, and the Black Rook are. If the upper left is 1/1, and the lower right is 8/8, then the positions are 3/3, 7/4, and 1/5. Enter the Mausoleum. Look at the Chessboard. Right-click on it to get access to the squares. You must press three squares in the correct position, and the correct sequence. When you have pressed the correct squares, the base opens and you can take the Old Objects. There are three: a Doll, a Paper Scroll, and a Rectangular Crystal. Examine that scroll. It shows a clock with two faces, set at 8:55 and 7:10. If you have been observant, and exploring things, instead of blindly following this walkthrough, you will remember seeing that two-faced clock in the lower corridor of the Old Wing, where it turns the corner. Is Victoria still in the Old Wing? If so, switch to her. Go to that clock, and set it according to the Scroll. It's easy enough to set, just like any antique clock, you push the hands around. (One player informed me that she wasn't able to set the clock accurately until she turned the Graphic Acceleration down.) The Secret Passage opens, and you are in the Arcanum. You must play the following sequence as Victoria. She can read Latin, and Darrel cannot. Sit back, save your game, and get rid of any distractions. You do not want to answer the phone, the doorbell, talk to spouses or kids for several minutes. Open the bag sitting on the floor, and take the Diary. An automatic series of cutscenes shed light on the basic story. You will meet Jacob Krenn, and Tony Corona, and get some useful information: a statue depicting an Angel and a Lion might be the key to the Pendulum Room. You might have seen this statue, if you are an intrepid explorer. Important: Look in the bag again. You will find some old Photographic Plates, a Mold, and two vials of liquid. Look at the desk. You will find an Old Parchment. To read the parchment, look at it in inventory and right click on it. You will also find another Diary. Read all the paragraphs, and the final page, describing the twenty-four immortals. Wow! Pretty heady stuff. Now we know what this is all about. It's basically a Good-against-Evil situation, where a well-intentioned and very powerful figure has set out to solve the world's problems, and has seen his plans go awry because a few of his chosen figures have turned to the 'dark side.' Ah well, if he couldn't save the world himself, let's see what we can do to help. Onward and Upward. Assuming you are playing as Victoria, switch to Darrel. Go into the castle, take the Service Lift to the First Floor, and go into the Sauna. Find the Bag sitting on the bench, and take it. Take the Service Lift again, to the Second Floor. Turn left, and enter the Gym. Find the Bicycle Machine and take the Batteries out of it. It helps to use the close-up view here. Did you already explore the Multinational's Conference Room? If not, go there now. It's a bit of a trek. The most efficient way to get there is to take the Service Lift to the Ground Floor, go through the bathrooms to the dining room area, into the kitchen, and up the stairs. The cook might be back on duty, scrubbing the sink with his handy Chore-Girl. Or he might be still in his room napping, depending on how independent you are. In the conference room, examine the shelves. Inside the Door, third section from the left, find the Walkman. No tape and no batteries you say? Open your inventory and combine the tape with the walkman, and combine the batteries too. Now you can right-click and hear Tony rambling on. Did you hear him dialing the phone at the end? Do this: Open inventory, and right-click on the 'Telephone' and use it on the Walkman. It records the phone number of the CIA. How handy. Don't forget to Process the number after acquiring it. Go upstairs and you should find Anderson dissolving his troubles at the bar. Don't forget to always talk to everybody about everything. Do this: (if you do not have the photographic plates in Darrel's inventory) - Open inventory, select any item, click on Victoria's name, left-click on the 'Plates' transferring them to Darrel. Also transfer the syringe containing Nitric Acid to Darrel; click on Darrel's name, and Close the inventory. Re-open the inventory, and give the Plates to Anderson. He retreats to the darkroom. Go down two flights of stairs, and into the Pool Room. Look at Jude's chair, and she has left a book behind. Check out the book and the bookmark, depicting a bleeding rose. Go into the Guest bathroom, and in the Towel Cupboard, open the door at the bottom, find the bottle of Sulfuric Acid and use the Nitric Acid on the Acid, creating a highly corrosive substance. Let's hope it doesn't drip in your pocket. Go out the front door, down the ramp and into the Garage. Find the Van belonging to the Multinational. Use the Acid on the Lock. Move the Sack of earth to find the Computer. Use the close-up view to see the modem lead. Use the telephone on the Lead. Enter the code number (231074) either with your own keyboard, or the keypad displayed on the screen. Read your e-mail. There is much stuff to read. The Mercury files describe the possible hoax depicting landing on the Moon; and the Confidence files describe the use of Sodium Fluoride to brainwash people. Essential: use the Search function to open the ARL 1998 file. It describes exactly how to use the red and blue liquids to produce a new material. Go to the Kitchen. For fun, you can walk outside around to the rear of the castle and use the Cook's entrance to the kitchen, or just go through the foyer and dining room. Open the Microwave Oven and place the Blue Phial in it. Switch on the power to the Oven, and raise the temperature to 70° according to the instructions you found in the computer. Take it back. Go into the Fridge room, place the Red Phial in the Freezer and set the temp to -25°. Retrieve the Phial. Open your inventory and use the Phials with the Mold, creating the Medallions of synthetic metal. Go to your room. That is, take the lift to the Fourth floor, and into your bedroom. Exit the other end of the room onto the Terrace. Walk straight ahead, and discover the Clock Tower. (You are able to look up and see the clock.) There is a slight crack in the wall surrounding the tower. Right click to climb. Oooh. Hope you're not afraid of heights. Look at the Bas-Relief. There is a speck on the next section of the wall to the right of the Bas-Relief. It's a weakness in the Plaster. Looks like you need some sort of tool to chip away at the plaster. If you did not visit the Caretaker before, you need to do that now. To save some hiking time, assuming you are on the tower as Darrel, switch to Victoria. She's probably still in the Old Wing, and a lot closer to the Caretaker's house than you are. She can get the chisel for you, and switch it to your inventory. By the way, you can't switch characters (F8) from the tower or the terrace. You will have to go back inside. Just a reminder - when you are trying to exchange objects, if you are Darrel, you can only receive things from Victoria, you can't give things to her; and if you are playing as Victoria, you can only receive things from him, not give them. So for Darrel to get the chisel from Vicky, switch to him first. Then go to inventory, left click on anything, click on the name-tag, left click on the chisel, click on the name-tag again, and Close. Simple, right? It's a puzzle in itself! Use the chisel on the Plaster. You reveal a clock-face. You still have that clock-key don't you? Use it, and open the way to the tower. Looking around inside, you find a Machine. Opening it, there is a Ring and a Pile of Sawdust. 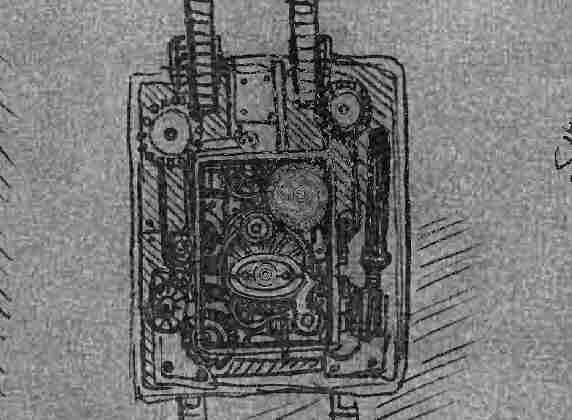 Apparently, the woodworms have eaten the cog that makes the clockwork function. Woodworms huh! Where's Simon when you really need him! Take the Ring. On the floor, the other side of the opening is a Trap Door. You can open it, and remove the broken parts. Further around the tower is a Chest. It seems to be blocked. Go back to where the machine is, and keep going right a little. Hard to see, but you are standing at the head of a stairway. Climb down the steps. You are in the Catacombs. Find the Stone Slab. It's the only non-carved wall. Try pushing it. You are not strong enough; you need help. The lever moves the slab, but it won't stay open. Open your inventory (Tab) and click on Victoria's icon. She joins you. Using Victoria to pull the lever and Darrel to push on the wall, the entrance to the underground of the Chapel is opened. Examine the Altar and the two small Statues, one with a bracelet and one without. Do they remind you of something? A picture you have seen perhaps? Go up the spiral stairs. You emerge through an opening in the back of the Altar. Go to the main entrance to the Chapel, find the Lock, and raise it, making the door accessible. Exit the Chapel, go into the greenhouse, and straight through to the courtyard on the other side. Around the fountain, find the Statue depicting an Angel and a Lion. This would be a dandy time to save your game. Use a Medallion on the Lion's Mouth. As you do, Victoria will appear, and an automatic cutscene unfolds, where you give her the medallions, enter the Chamber, only to find Raul's body and a Silver Object. Darrel doesn't seem to want to go back up the stairs just yet. Let's go have a look at the door on the other end of the room. Examine the symbol in the center of the door. It resembles that silver object, with its six buttons top and bottom, and two stylized faces, one dark and one light. Right-click to try the puzzle. Oops - the Sand Trap is activated. Good thing Vicky's on the job. Have her use a medallion on the Lion's mouth to free Darrel. Return to the Castle, and get a scolding from Greta, the Housekeeper, for allowing the Cook to be drunk and sleep the afternoon away. He is in one of the Guest Bedrooms on the Fourth floor, snoozing. If you seem to be stuck at this point, it's because you did not complete some of the conversations. Most likely is the question posed to Stephen about Greta. Since he is asleep, you cannot talk with him, but if you go find him in the bedroom, then return to the kitchen, he will have gotten up and you can ask the question, triggering the scene with Greta as you leave the kitchen. Go to the Dining Room and use the Bag of Blood on the Rose. Then, with the service lift, go to Floor 3 and visit the Supervisor's Apartment. See that greenish painting? Take it down to discover a Keypad. Remember the combination from the invoice found in the filing cabinet? Open the safe with the combination 1, 2, 4, 8, 0. We're not out to steal anything, but that Old Coin will be useful. If you like, cover your tracks by closing the safe and using the painting on the safe. If you have been a good investigator, you might have already explored the Fireplace Bedroom on the Fourth floor, and found the two envelopes in the desk drawer. If not, go get them now. Then go to the Old Wing and upstairs to the Scale. Put the coin in the left pan. Use some Incense on the right pan, then use an envelope on the right pan. This gives you an object that weighs the same as one coin. Use some incense on the right pan, and use the same envelope on it, giving you an object that weighs the same as two coins. Repeat the whole process with the other envelope. Take the Coin from the Left pan. Are you Darrel? Send Victoria into the Crypt. (Vice-Versa works also. Just keep one character in the Old Wing and the other in the Crypt.) Go to the altar with the two statues. Use your inventory to retrieve the coin and the envelopes from Darrel. Remember the Picture? Use an envelope on the left hand, and the coin and the other envelope on the right hand. The altar opens and you can take the Metal Plate. Switch to Darrel, and retrieve the Metal Plate from Victoria. Go to the two-faced clock and set to open the Arcanum. The times are 9:55 and 7:10. On the altar, move the candlesticks. If you examine the metal plate, it turns out to be two plates. help together by magnetism. Use each plate on the slabs revealed under the candlesticks. The glowing sphere rises a little, and you can take it. Exit the Arcanum and go back upstairs. Go to the upper corridor, and find the two doors beyond the scale: one on the left, and one at the end. Go into the left room. The essential item in this room is a manuscript on the other side of the room. It depicts some star-chart figures. Go into the other room, the one at the end of the corridor. Go around the back of the big clock in the center of the room, and open the compartment. Place the Sphere, the Crystal, and the Necklace in the holes. Touch the Angel on top to see a holographic projection. Take careful note of the Chest, with its hourglass knobs turned to the unlocking position. Take the crystal from the clock. Switch to Victoria, and retrieve the Crystal from Darrel. Climb up into the tower. Go to the chest, and place the Crystal in the slot. Set the hourglass knobs to match the picture above: upper right, left, lower right, lower left, upper left, and the chest opens. Take the New Metal Disk and use it in the Trap Door. Go back down stairs so you can switch characters, and switch to Darrel. Go to the Supervisor's Office. When you enter the Supervisor's Office, he comes out of the darkroom and gives you the two photos he has developed from the ancient plates. Look at them in your inventory. Use the Photo Plan on the Scanner. Right-click on the computer. Choose Preview, then choose Select Area. Slide the rectangular selection tool so the view shown here is outlined. Choose Scan. Exit the computer. Darrel takes the enlarged scan. Go to the Caretaker's house. If you've been exploring and experimenting on your own, you might have tried to show him the bronze ring before. If you then show him the Photo Plan before enlarging, it was not big enough. That's how you might think to scan it. You also must have given the Caretaker his glasses by now, or he cannot help. Use the Bronze Ring (get it from Victoria) and the Enlargement on the Caretaker. He makes a new Cog for you. Switch to Victoria, and take the Cog and the Silver Object from Darrel. Go back up the top of the tower, open the Machine and put the Cog in the Machine. Pull the lever, activating the ancient mechanism. The rotating tube causes the central floor to lower, taking you to the Labyrinth. There is another lever on the wall, in case you need to return to the top level. When you open the door, an automatic cutscene will play. If you have any desire to see it more than once, you will need a recently saved game. Go to the door, similar to the door in the Sand Trap room. Examine the Silver Object to figure out which buttons to push. They are 2, 4, 5 and 6 on the top, and 1, 2, and 5 on the bottom. Chauvin, er, Darrel goes into the passage. Keep walking into the Astrologium. See the three levers to the right of the giant clock? They are used to set the Astral Clock. The clue to the setting is the Manuscript found in the Planetarium room in the Old Wing. Set the clock to 4 hours, 15 minutes, 41 degrees. Now the bars blocking the other two passages are raised. Go to the Watchmaker's Study; the passage without stairs. Look at everything. Go to the desk, take the Envelope and read the letter. Take the Old Records and read the file. The scene shifts to Victoria, in the castle gardens to the South. Important: Save your game now. Throw the Padlock at the window to get the Hunter's attention. You duck backwards and he comes after you. Press the Caps Lock so you will be running. Do NOT try to hide behind the Mausoleum. Go West instead, to the Greenhouse. Enter the Greenhouse, and exit the other side into the Courtyard. Go to the Statue and use a Medallion on the Lion's Mouth. You will duck behind a bush as the Hunter falls for the Trap. Control switches back to Darrel. Take the Metal Star from the desk. Exit this room, and go down the stairs into the Machinery Room. Examine the opening in the Cogs. Use the star on the Cavity. This allows you to change the settings on the Machine. Remember the Indicators in the Well? Set the machine's indicators to stop the Cogs and allow you to pass through. The settings are 2, 7, 4, 11, 9. Go through the opening to see some nasty business. Hurry back to the machine and return the indicators to all sixes, causing the Cogs to whirl and 'stop' the intruder. Reset the Indicators to the above figures to stop the Cogs again. Enter the passage. Look at Corona's body. Continue into the Pendulum Chamber. Darrel is knocked out by Krenn. Open the door. You still have the Silver Object, if you need to refer to it. Go to the Machinery Room and take the Metal Star. Go through the opening, past Corona's body and into the Pendulum Room. You are hiding behind a pillar. Take two steps forward, and press <Space> so you have the first-person view. Watch Krenn as he shifts his gaze. Two ticks, looks at you. Two ticks, looks at Pendulum, Two ticks, looks further to the right. Just after he turns right from looking your way, press space, and (shift) run into the next room. (I have better luck with the arrow keys than the mouse, but that may be because I played Time Machine.) You are in a room containing the following: A bas-relief, flanked by two star-shaped cavities. You possess one star, and will have to come up with another one somehow. On the other side of the room is Duke's body, and a Lion's head. Examine Duke's body, and find the Lighter. Use your last remaining Medallion on the Lion's head. A Passage opens. Go up the stairs, and find yourself in a dead-end. Turn around, and pull the lever. Now you can go through the Astrologium and into the Watchmaker's Study. Go to the desk and take a Candle. Place the candle in the Brazier. Melt the wax with the Lighter. While the wax is soft, press the Metal star into it to create a mold. Use the Half-empty Phials on the mold to create a new Metal Star. Return to the room with the Bas-Relief, and use both stars on the cavities. The Altar opens, and there are four containers; blue, green, red and yellow. Use the blue, green and yellow liquids to make the Ley-Lines visible. Krenn is distracted, and you knock him out. Take his keys, and use them on Darrel's handcuffs. The closing scene unfolds, where the Immortals are foiled because the clock had been set ahead an hour without their knowledge. Any proposed changes or additions to the walk through may be submitted to Tally Ho. All images and concepts property of Precision SpA or Got Game Entertainment LLC.